« Summer of Heroes at Disney California Adventure! New Experiences & Dining Options Coming to Disney Moderate Resorts! There are some great changes on the horizon at two of Disney’s Moderate Resorts over the next two years. Disney’s Coronado Springs Resort will be expanded to include a new 15-story tower that will add 500 rooms, featuring suites and concierge level services. The resort will also refurbish its current resort rooms and transform its landscape with floating gardens and an island oasis that connects the resort through a series of bridges. 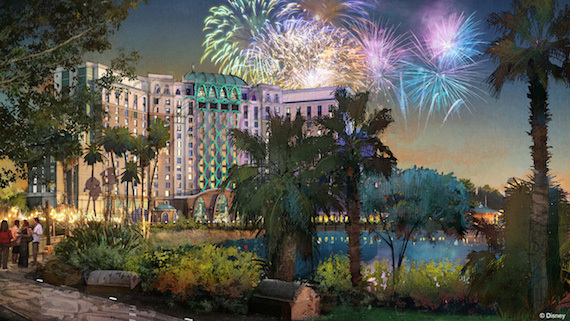 The new tower overlooking Lago Dorado, the resort’s centerpiece lake, will allow you to experience something truly unique at a Moderate Resort — rooftop dining with panoramic views of popular nighttime fireworks from nearby Disney theme parks. Also during this exciting time, Disney’s Caribbean Beach Resort will be reimagined with new additions to the resort’s current marketplace, Centertown, including new waterfront dining and retail shopping areas. This centralized location will offer the resort’s guests more convenient access to services, amenities and dining. This entry was posted on February 17, 2017 at 1:58 pm and is filed under Disney News, Disney Vacation Planning, Resorts, Walt Disney World. You can follow any responses to this entry through the RSS 2.0 feed. You can leave a response or trackback from your own site.